Every employer is entitled to establish its own attendance policies for its employees. However, employers should keep track of employees' attendance in order to be sure that employees are eligible for certain attendance-related benefits and coverage under many federal and state acts, such as the Family and Medical Leave Act. Fields for employee name, social security, job title, etc. Many employers offer their employees insurance benefits as part of their employment compensation. Insurance benefits may include healthcare benefits in addition to disability benefits, unemployment benefits, workers' compensation benefits, and more. Information about these benefits and about employees that are receiving these benefits should be neatly organized so that employers can access them efficiently at any time. 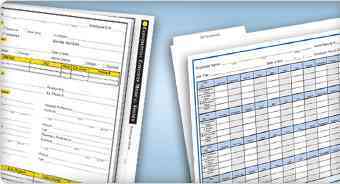 This folder is 9" x 12"
All employers should have a neatly organized system for maintaining employee records for current and past employees. While not all records are required to be kept for current or past employees, they can still be helpful for employers in many conditions. Therefore, many employers prefer to keep all employee records neatly organized in one unit in order to stay organized and to be sure that they have the records if they are ever asked to provide them. Using the employee record organizer, employers can easily find information about an employee’s attendance, benefits insurance, employment history, payroll taxes, and more. This organizer helps to ensure that businesses stay organized, efficient, and up-to-date with important records for all current and past employees. Employers are required to keep ex employee records for different periods of time, depending on the type of record. For example, payroll records need to be kept for seven years. Businesses may need these records in the event that they are audited. Employers should also be able to supply these records to employees in the event that employees are audited as well. Employers should keep personnel records for at least two years. However, this amount of time may vary from state to state. In most cases, employees have up to two years to sue an employer. If an employer is sued, the employer should be able to produce information that supports his or her case. For example, if an employee sues an employer for wrongful termination, the employer should be able to produce the employee’s personnel record and that personnel record should provide acceptable reasons why the employee was terminated. Because different types of records need to be kept for different lengths of time, most employers opt to keep all records together for the longest amount of time required. Therefore, most employees will retain all employee records for at least seven years, even if those records are not required to be kept for that long. Using this organizer, employers can be sure that they always have access to the necessary employee records for those employees that are currently employed and for employees that are no longer employed with the organization. Don’t get caught unable to find important information when you need it; keep it organized in the convenient employee record organizer! The Employment History Folder provides you with a simple and efficient way to keep track of employment history. The convenient New Hire Checklist allows you to keep track of which forms have or have not been completed. From promotions, to demotions, to status changes, stay organized while insuring you complete all the steps necessary for your new hires. This durable folder comes complete with tab dividers for easy access. Fields for employee name, social security. job title, etc. This forms is 8.5" x 11"
Employers with full-time employees or employees that have worked for a certain period of time will be required to pay payroll tax for those employees. Each state has different requirements in terms of what types of employees employers need to pay payroll taxes for and how long those employees need to have been employed in order for the employer to have to pay payroll taxes. Employees should receive regular performance evaluations from their employers. All employers have their own performance evaluation schedules, but most employers perform performance evaluations at least once annually and whenever an employee is eligible for a raise or promotion. These performance evaluations should be organized and easily accessible for each employee so that employers can quickly gain access to important information about employees’ performances.